ASTORIA – The cultural event organized jointly by the Federation of Cypriot American Organizations (FCAO), Hellenic American Leadership Council (HALC), PSEKA (Justice for Cyprus), the Cyprus-U.S. Chamber of Commerce, and the American Jewish Committee (AJC), under the auspices of the Consulate General of Cyprus in New York and the Consulate General of Israel in New York, was held at Dionysos Restaurant in Astoria on January 15. All those present enjoyed traditional Greek-Cypriot and Jewish food and beverages, as well as music from both communities. Speeches and greetings were shared at the event before the music began. The event took place at the initiative of FCAO President Kyriakos Papastylianou. PSEKA President Philip Christopher led a moment of silence for the late Nikos Mouyiaris who, he noted, would have enjoyed such an event bringing together the communities and encouraging cooperation. Christopher thanked the AJC, and asked that gratitude be expressed especially to AJC Chief Executive Officer David Harris who was not present at the event. 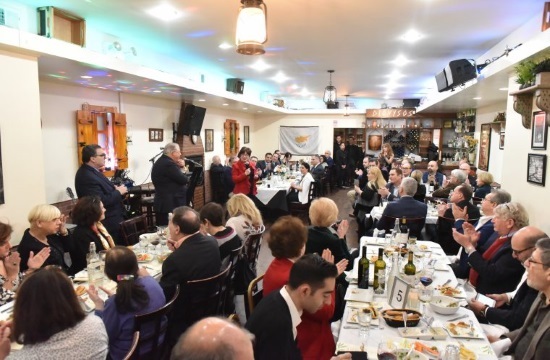 Among those present were Cyprus-U.S. Chamber of Commerce President Nicolas Nicolaou, Executive Director Despina Axiotakis, and Director Costas Kellas.